Ready for a flavorful fruit dessert! Poached Pears in White Wine delivers a fabulous dessert in less than 30 minutes. Your guests and family will love this sophisticated yet easy dessert! Vegan-friendly, Gluten-free, low-carb, low-calorie, low-fat, Paleo-friendly, Keto-friendly. 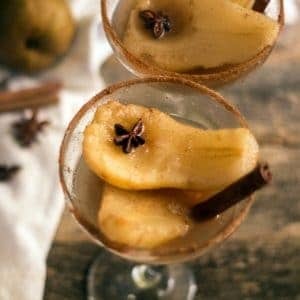 Poached Pears in White Wine is an awesome alternative to baking a pie for Thanksgiving or any celebration with a wonderful presentation that will WOW your guests! Top it off, is not only delicious, these poached pears are low-fat, low-calorie and ready in under 30 minutes Another plus, make the poached pears in white wine ahead of time and re-heat right before serving! With Thanksgiving fast approaching, everyone is shopping, planning menus and baking! Truly a great time of year! However, oh so difficult to maintain our workouts and exercise schedules. We worry if those Holiday pants are going to button up! UGGHH! As many of you know, I believe everything in moderation! Yes, I will have a slice of apple pie, a Christmas Cookie, and most definitely a glass of my favorite Ultimate Festive Winter Sangria! Use Bartlett Pears if possible, I find they hold up to poaching. A melon scoop or teaspoon to remove the pear pits easily. Use a sweet wine like Moscato or Sauterne. I use either a hard pumpkin or hard apple cider, whichever I can get or have in the pantry. If you prefer to not use any alcohol, use all apple cider. Easily make this dessert ahead of time and re-heat. Serve plain or with frozen vanilla yogurt or chocolate sauce, or both. I HOPE YOU MAKE THESE POACHED PEARS IN WHITE WINE! TAG @EVERYDAYEILEEN OR EVERYDAY_EILEEN! THAT WOULD MAKE MY DAY, I LOVE SEEING YOUR CREATIONS! I HOPE YOU ENJOY MAKING THIS RECIPE ! I’D LOVE TO HEAR FROM YOU IN THE COMMENTS! 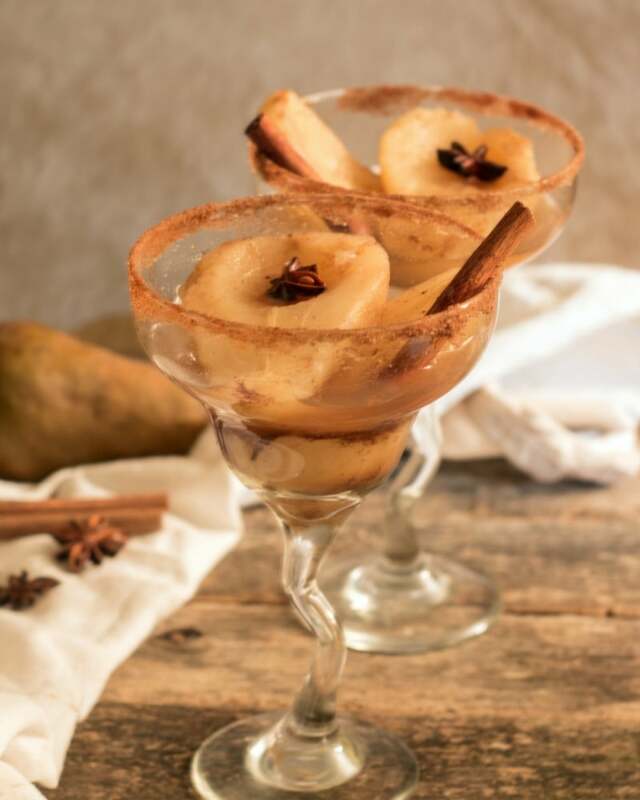 Fresh Bosc pears poached in white wine and either pumpkin or apple hard cider with a cinnamon stick, allspice, nutmeg and either honey or agave! Sophisticated dessert with little effort! In a saucepan, over low heat, add the dessert wine, cider of choice water, cinnamon sticks, raw honey or agave, nutmeg, and allspice, ground ginger, and ground cinnamon. Stir to combine all ingredients. Add in the pears and cook for about 10 minutes and then gently turn pears over to cook at least another 10 minutes. Begin checking pears for tenderness. Should take no more than 20 minutes. Remove the cooked pears with a slotted spoon to a platter. Turn up the heat on the white wine mixture, bring to a boil and reduce down to a syrup like sauce. The mixture should reduce by at least 1/3. This takes approximately 10 minutes. 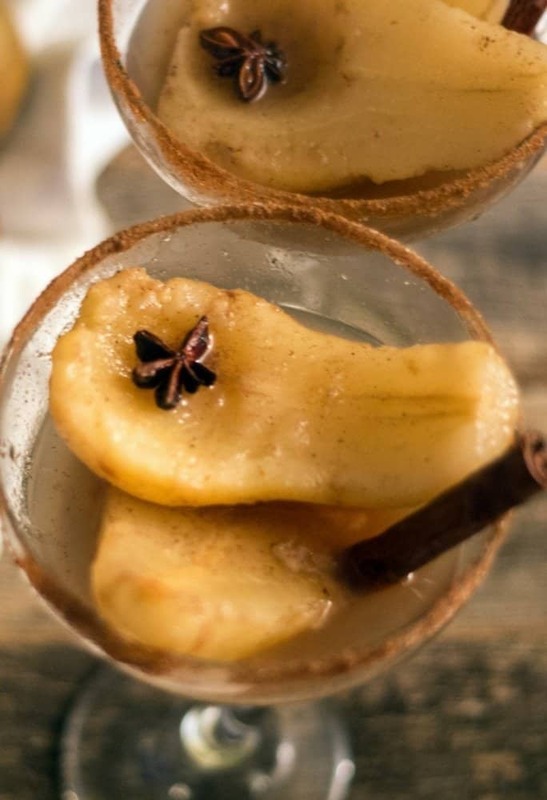 Serve 2 pears in either Margarita glasses or dessert bowls. rizzle white wine sauce over the pears. Can refrigerate and reheat sauce and reheat the pears. Drizzle white wine sauce over the pears. If you prefer not to cook with wine, use either apple or pumpkin cider. For added garnish, combine cinnamon and sugar in another bowl, set aside, Dip the serving glass in either white wine or apple juice and then into the sugar/cinnamon mixture for a rimmed sugar glass. This one is something new to me. I should try this during the holidays – my family will enjoy it. I hope you do and your family enjoys, it is really tasty! Pears are one of my favorite fruits. I’ve never heard of pumpkin cider. My Hubby would love that. This easy recipe is on my “to do” list. YUM. I find the pumpkin cider usually around the fall, but you can use apple cider or pumpkin beer, as well! I am so glad you are going to try this recipe. I hope you let me know how it goes! Wow, this sounds really classy! And tasty too! Oh my that sounds very good! I have never had poached pears before. This looks great. I would have to use some sparkling juice since I don’t drink alcohol. This recipe is so perfect for holiday entertaining. It looks tasty with a beautiful presentation. Thank you so much, so happy you enjoy! Oh yum this sounds just delicious. I’ve never had poached pears before, I’ve never really had much pears. So this would be great to try! I hope you do, this is yummy! I bet this is such a yummy treat and it’s sooo perfect for thanksgiving too! I would definitely try this out. I love pears! They have been so good lately! This recipe looks simply delicious and would go perfect with any menu for the upcoming holidays. I think I will make this for a party I am having in a few weeks. Fantastic! I hope you enjoy! Let me know how you enjoy! I’ve never had poached pears in white wine. This looks delicious! Thanksgiving gone here but will mos definitely try for Christmas! These poached pears look delicious. It’s the perfect sweet treat to enjoy for the holidays. I’ll have to make this for my mom and dad sometime. Boy does that ever sound delicious! I’m not sure I’ve ever had a poached pear, but boy am I game! That looks like a yummy dessert. I like white wine and I’d like to try this. This looks so delicious! I adore pears but haven’t had them in a dish like this….yet! It seems like his would meal a great light and refreshing dessert at a dinner party. Thank you , it is easy and everyone always enjoys! These poached pears look so delicious! I really like the idea of using apple cider instead of wine. Have to try it out for sure! I am so glad, enjoy! Great! Let me know how the family enjoys! Thank you very much! These are really delicious and easy to prepare! I so love poached pears! This is amazing, thank you very much for the recipe! It’s perfect for the Holidays! This sounds so delicious. I love white wine, and I love pears, so I bet they are the perfect combo. 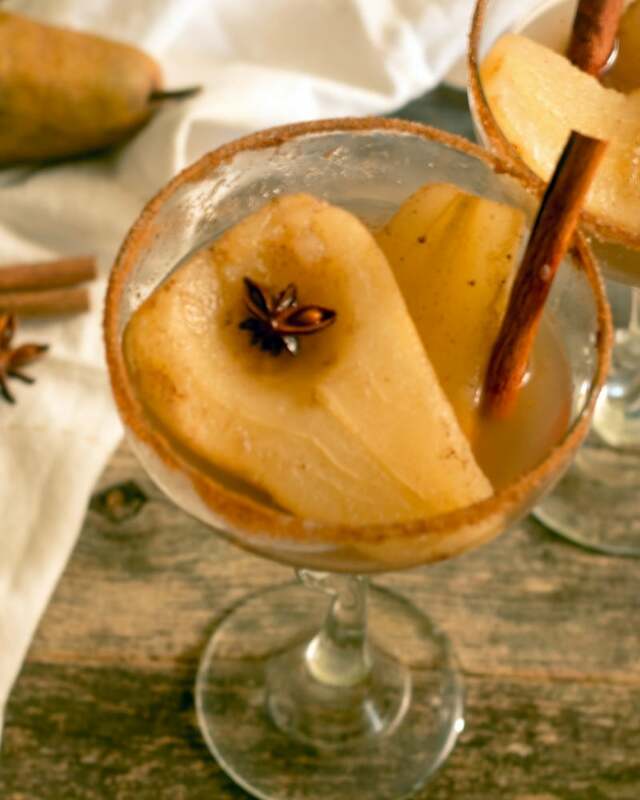 Did I tell you that bloggers rock….I loooooooove pears and I must try this one…Good share! Add me to the trio as well. This is a lovely way to enjoy it too. I bet these have a wonderful taste. I should make these. This sounds like an amazing desert for the festive season! Thank you, yummy and low-cal too!